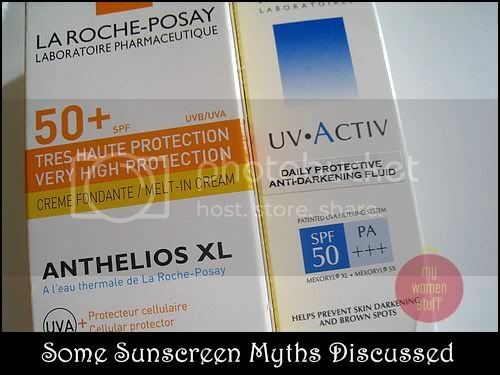 Home » Interesting Discussions » 5 Sunscreen myths debunked! There are some beliefs and myths about sunscreen and its application that might be worth remembering aren’t quite true. I’ve heard of some of them quite often and most are things I hear over and over so here are 5 sunscreen myths debunked. False. You need sunscreen EVERYDAY. The ozone layer and clouds help screen us from some UV rays but at least 80% of the rays still hit the earth and even if you don’t feel the heat of the sun, UVA rays are still present. Not to mention that whatever UV rays that hit the earth get reflected off surfaces and yes, onto our skin. False. Even if you do not get the sun’s rays UVA rays can still penetrate into our homes. Also, UV rays get generated from lights and television screens and computer monitors so do not abandon your sunscreen even if you are planning to stay indoors the whole day. False. Try to look for a sunscreen with physical blockers like Titanium Dioxide or Zinc Oxide or natural sunscreens. It is common for people to be allergic or to break out from chemical sunscreens but physical blockers will have a lower risk of breaking out sensitive skin. This is not to say that physical blockers will 100% be safe for the skin. I discussed what are chemical and physical sunscreens in a previous post. False. SPF is a measure of sun protection and an accepted measure of how the sunscreen performs against blocking UVB rays. However there is no general accepted measure of UVA blocking. Japan uses the PA rating for rating UVA blocks which we are familiar with these days. So, in the tropics try to get a sunscreen with at least SPF30 and PA+++ for better sun protection. False. Sunscreens have a shelf life of between 2.5-3 years from the date of manufacture. After that the ingredients may not be as effective anymore and you may in fact be doing your skin a disservice by using old sunscreen because the blockers may no longer be doing their job effectively. Always buy sunscreen that is as close to its manufacturing date as possible. This also means that unless you can get fresh stock at a warehouse sale, that is no place to shop for your sunscreens! Have you heard of other sunscreen myths? Are there other myths you’d like debunked? PREVIOUS POST: Strivectin-SD Eye Cream GWP for My Women Stuff readers! I slap on sunscreen every single day, rain or shine too! Even when at home – I’m not taking any chances. I’m with you! I wear SPF 90+ with Helioplex/UVA broad spectrum protection every day! I did miss the tops of my shoulders the other week wearing a wide-necked top, and I look like a farmer as a result! Oh dear! I hope the tan goes away soon – which sunscreen are you using? Thanks for the post 🙂 this is great info about Sunscreen, I was wondering if you have used Mineral Sunscreen before? any thoughts on that? I know about having to wear sunscreen at home due to the UV rays from fluorescent lamps, tellies, computer screens etc. But does that mean we still have to wear it in the evenings and at night? That’s a question I can’t seem to answer. Question: Do you apply sun screen just on your face or all over your body when you’re staying home for the day? And do you also need to reapply throughout the day? Thanks! there’s another myth! If you’re already wearing a moisturizer or foundation with SPF you don’t need to use a separate sunblock. PS: I am so sick and tired of MNCs trying to tell us we need separate creams for everywhere, like neck, hands, feet. Try Clinique’s City Block. Can be used on face and eye area. Also has a tint so it skips the need for foundation. I use a lip balm with SPF on my lips. Absolutely necessary, esp if you’re in Aus/ NZ. 30% of men there get lip cancer because they dun use lip balm.